A brief history of the turntable and vinyl records | What Hi-Fi? The turntable as we know it today has only been around for seven or so decades, but its technological roots go back over 160 years. 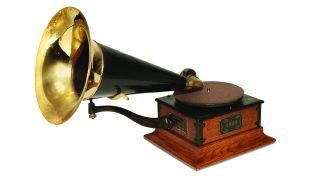 In 1857, French inventor Édouard-Léon Scott de Martinville, showcased his phonautograph. It used a vibrating diaphragm and stylus to record sound waves by tracing them on sheets of paper, but it could only visualise sound waves and could not play them back. It was this concept that led to Thomas Edison's invention of the phonograph in 1877. The forefather of the turntable, Edison's phonograph initially comprised a grooved cylinder wrapped in tin foil (the recording surface) that could be turned by a hand crank. When sound was entered into the mouthpiece, the sound waves made the diaphragm and attached needle vibrate, making indentations in the foil. Edison soon swapped out tinfoil for wax for its better sound and improved durability. Ten years later, 1887, came the next peg along the turntable line: the gramophone. The patent of Emile Berliner, it used a needle to laterally trace spiral grooves onto a cylinder. Soon, cylinders were replaced by flat discs, initially made of rubber and, later, shellac. At the turn of the century, these discs – or rather ‘records’ – were being mass-produced, and the gramophone’s design had been tweaked to make it more functional in the home. While the horn necessary to amplify the sound was initially large, it was altered by US phonograph and record brand Victor Talking Machine Company to tilt down so the whole device could fit in a cabinet. The device’s name: Victrola. In the 1930s, wind-up players were being replaced by their electric-powered successors, and after the increasing popularity of bulky turntable systems with built-in amplification and speakers, came the rise of the dedicated hi-fi record player. Radio Corporation of America had purchased the Victor Talking Machine Company, and the newly-formed RCA Victor had not only began selling 33⅓ rpm records but also knocking out the Duo Jr, the first component turntable designed to be plugged into radio sets, negating the need for a phonograph’s built-in amplification and speakers. It retailed at an affordable $16.50 (the equivalent of about $233 today). It's fair to say this product was a not insignificant step along on the journey to the separates vinyl system. Turntable’s on the shelf today will mostly be belt-drive and, less typically, direct-drive systems, but the first record players sported what's called idler wheel designs. The first stereo turntables were record changers that could play several records in a row. Records would be stacked on a spindle on top of each other, and when one finished the player would automatically spin the next record. Less flipping, more listening. For the turntable to spin at the correct speed under the weight of a handful of records, torque was important, and thus the idler wheel drive – a rubber wheel that ran off the motor and sat underneath the platter, acting to isolate motor vibrations from impacting the platter and, therefore, the music playback – was the ideal drive system. But the idler wheel method had its disadvantages. As the wheel was coupled to the motor, vibration from it could impact the record’s sound, and the single-record-playing turntable that emerged didn’t require such a high-torque system. The belt-drive turntable was a much more efficient, simple and cost-effective method, with a motor off to the side driving a rubber belt that wrapped around the outside of the platter to turn it. The belt absorbed vibrations, thus helping to isolate motor noise from the platter. In the mid-’60s, Acoustic Research’s The AR Turntable (pictured, above), which pioneered the three-point suspension turntable design, was among the most popular in the first wave of belt-drive models. Last but by no means least, the direct-drive was invented in the early ‘70s by none other than Panasonic's Technics brand, debuting in the classic Technics SP-10 turntable (pictured, above). Here, the platter sits on top of a drive motor that spins at 33 1/3 or 45 RPM. Unlike the idler wheel and belt-drive designs, there shouldn't be anything to replace or repair, with no belts and no wheels. The drawback was cost, which is why you'll tend to only find direct-drive decks on higher-end turntables. First things first, the all-important speed. The crudeness of the hand crank mechanism on early turntables meant that setting a record speed standard proved difficult. The first common speed emerged as 78rpm in the early 1900s when electrically-powered turntable motors came into being. Why 78? Because the motors ran at 3600rpm with a 46:1 gear ratio, producing 78.26 rpm. The records themselves were initially made of shellac, but the shortage of resin during World War II prompted manufacturers to press on vinyl instead. Then came a different kind of war: a format war. While Colombia Records developed the 33 ⅓rpm LP (‘long play’) format in 1948, RCA Victor released an 45rpm format almost immediately to counter it. Both disc types featured narrower (or ‘micro’) grooves – typically 0.001ins wide, compared to 0.003inc for a 78 – designed to be traced by a smaller stylus. Following experimentation with 10in and the initially less popular 12in sizes, which could produce three to five minutes of audio respectively, the industry settled for 7in and 12in formats. The 12in 33 ⅓rpm LP prevailed for albums, while the 7in 45rpm record became the more niche ‘singles’ format. The briefly popular ‘78s’ dropped off in the 1950s. And what about the sound itself? For a good while, records were mono. Stereo records only arrived in earnest in the late 60s and early 70s, initially hindered by the fact radio stations didn't have the necessary equipment to play stereo recordings. By the mid-1970s, the majority of vinyl releases had shifted to stereo. While on mono reproduction the stylus moves horizontally, on stereo records the stylus moves both horizontally and vertically. No small change. The 1970s were the golden era for all things vinyl. But all good things come to an end, and with the popularity of cassettes, followed by CDs in the 1980s, vinyl quickly became considered a thing of past. But you can't keep a good thing down. And the much-discussed vinyl revival has seen an unprecedented resurgence in the aged format, as young and old music fans discover the beauty of physical media and the enjoyment to be had in taking the time to sit back and listen to a piece of music (and then get up and turn it over). Naturally, we've seen a resurgence in record players, too, not just budget and high-end classic decks, but also in the form of all manner of contemporary turntable spin-offs – from those compatible with Spotify to Bluetooth and vertical decks. There are digital turntables with USB outputs that can be used to turn your vinyl into digital files, and Bluetooth turntables that can wirelessly stream your spinning vinyl to Bluetooth speakers or headphones. Many modern decks also have built-in phono stages, allowing you to connect it straight into an amplifier, while we're also seeing more just-add-speaker turntable systems, complete with both built-in phono stages, amplification and even speakers.